For the Turnover album, see Peripheral Vision (album). Peripheral vision, or indirect vision, is vision as it occurs outside the point of fixation, i.e. away from the center of gaze. The vast majority of the area in the visual field is included in the notion of peripheral vision. "Far peripheral" vision refers to the area at the edges of the visual field, "mid-peripheral" vision refers to medium eccentricities, and "near-peripheral", sometimes referred to as "para-central" vision, exists adjacent to the center of gaze.. The inner boundaries of peripheral vision can be defined in any of several ways depending on the context. In everyday language the term "peripheral vision" is often used to refer to what in technical usage would be called "far peripheral vision." This is vision outside of the range of stereoscopic vision. It can be conceived as bounded at the center by a circle 60° in radius or 120° in diameter, centered around the fixation point, i.e., the point at which one's gaze is directed. However, in common usage, peripheral vision may also refer to the area outside a circle 30° in radius or 60° in diameter. 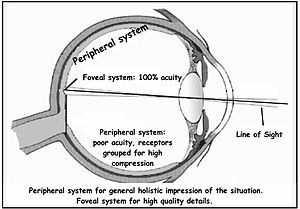 In vision-related fields such as physiology, ophthalmology, optometry, or vision science in general, the inner boundaries of peripheral vision are defined more narrowly in terms of one of several anatomical regions of the central retina, in particular the fovea and the macula. The fovea is a cone-shaped depression in the central retina measuring 1.5 mm in diameter, corresponding to 5° of the visual field. The outer boundaries of the fovea are visible under a microscope, or with microscopic imaging technology such as OCT or microscopic MRI. When viewed through the pupil, as in an eye exam (using an ophthalmoscope or retinal photography), only the central portion of the fovea may be visible. Anatomists refer to this as the clinical fovea, and say that it corresponds to the anatomical foveola, a structure with a diameter of 0.35 mm corresponding to 1 degree of the visual field. In clinical usage the central part of the fovea is typically referred to simply as the fovea. In terms of visual acuity, "foveal vision" may be defined as vision using the part of the retina in which a visual acuity of at least 20/20 (6/6 metric or 0.0 LogMAR; internationally 1.0) is attained. This corresponds to using the foveal avascular zone (FAZ) with a diameter of 0.5 mm representing 1.5° of the visual field. Although often idealized as perfect circles, the central structures of the retina tend to be irregular ovals. Thus, foveal vision may also be defined as the central 1.5–2° of the visual field. Vision within the fovea is generally called central vision, while vision outside of the fovea, or even outside the foveola, is called peripheral, or indirect vision. 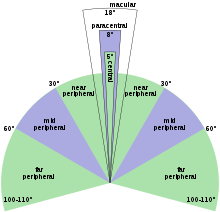 A ring-shaped region surrounding the fovea, known as the parafovea, is sometimes taken to represent an intermediate form of vision called paracentral vision. The parafovea has an outer diameter of 2.5 mm representing 8° of the visual field. The macula, the next larger region of the retina, is defined as having at least two layers of ganglia (bundles of nerves and neurons) and is sometimes taken as defining the boundaries of central vs. peripheral vision (but this is controversial). The macula has a diameter of 5.5 mm, corresponding to 17° of the visual field. The term is familiar in the general public through the widespread macular degeneration (AMD) at older age, where central vision is lost. When viewed from the pupil, as in an eye exam, only the central portion of the macula may be visible. Known to anatomists as the clinical macula (and in clinical setting as simply the macula) this inner region is thought to correspond to the anatomical fovea. The dividing line between near and mid peripheral vision at 30° radius is based on several features of visual performance. Visual acuity declines by about 50% every 2.5° from the center up to 30°, at which point visual acuity declines more steeply. Color perception is strong at 20° but weak at 40°. 30° is thus taken as the dividing line between adequate and poor color perception. In dark-adapted vision, light sensitivity corresponds to rod density, which peaks just at 18°. From 18° towards the center, rod density declines rapidly. From 18° away from the center, rod density declines more gradually, in a curve with distinct inflection points resulting in two humps. The outer edge of the second hump is at about 30°, and corresponds to the outer edge of good night vision. The outer boundaries of peripheral vision correspond to the boundaries of the visual field as a whole. For a single eye, the extent of the visual field can be (roughly) defined in terms of four angles, each measured from the fixation point, i.e., the point at which one's gaze is directed. These angles, representing four cardinal directions, are 60° upwards, 60° nasally (towards the nose), 70–75° downwards, and 100–110° temporally (away from the nose and towards the temple). For both eyes the combined visual field is 130–135° vertically and 200–220° horizontally. The loss of peripheral vision while retaining central vision is known as tunnel vision, and the loss of central vision while retaining peripheral vision is known as central scotoma. Peripheral vision is weak in humans, especially at distinguishing detail, color, and shape. This is because the density of receptor and ganglion cells in the retina is greater at the center and lowest at the edges, and, moreover, the representation in the visual cortex is much smaller than that of the fovea (see visual system for an explanation of these concepts). The distribution of receptor cells across the retina is different between the two main types, rod cells and cone cells. Rod cells are unable to distinguish color and peak in density in the near periphery (at 18° eccentricity), while cone cell density is highest in the very center, the fovea, and from there declines rapidly (by an inverse linear function). Flicker fusion thresholds decline towards the periphery, but do that at a lower rate than other visual functions; so the periphery has a relative advantage at noticing flicker. Peripheral vision is also relatively good at detecting motion (a feature of Magno cells). Central vision is relatively weak in the dark (scotopic vision) since cone cells lack sensitivity at low light levels. Rod cells, which are concentrated further away from the fovea, operate better than cone cells in low light. This makes peripheral vision useful for detecting faint light sources at night (like faint stars). Because of this, pilots are taught to use peripheral vision to scan for aircraft at night. The distinctions between foveal (sometimes also called central) and peripheral vision are reflected in subtle physiological and anatomical differences in the visual cortex. Different visual areas contribute to the processing of visual information coming from different parts of the visual field, and a complex of visual areas located along the banks of the interhemispheric fissure (a deep groove that separates the two brain hemispheres) has been linked to peripheral vision. It has been suggested that these areas are important for fast reactions to visual stimuli in the periphery, and monitoring body position relative to gravity. delivery of sensations which form the background of detailed visual perception. 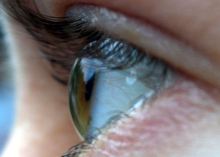 When viewed at large angles, the iris and pupil appear to be rotated toward the viewer due to the optical refraction in the cornea. As a result, the pupil may still be visible at angles greater than 90°. The rim of the retina contains a large concentration of cone cells. The retina extends farthest in the superior-nasal 45° quadrant (in the direction from the pupil to the bridge of the nose) with the greatest extent of the visual field in the opposite direction, the inferior temporal 45° quadrant (from the pupil of either eye towards the bottom of the nearest ear). Vision at this extreme part of the visual field is thought to be possibly concerned with threat detection, measuring optical flow, color constancy, or circadian rhythm. ^ a b c d e Strasburger, Hans; Rentschler, Ingo; Jüttner, Martin (2011). "Peripheral vision and pattern recognition: A review". Journal of Vision. 11 (5): 13. doi:10.1167/11.5.13. ISSN 1534-7362. ^ Sardegna, Jill; Shelly, Susan; Rutzen, Allan Richard; Scott M Steidl (2002). The Encyclopedia of Blindness and Vision Impairment. Infobase Publishing. p. 253. ISBN 978-0-8160-6623-0. Retrieved 30 November 2014. ^ Grosvenor, Theodore; Grosvenor, Theodore P. (2007). Primary Care Optometry. Elsevier Health Sciences. p. 129. ISBN 978-0-7506-7575-8. Retrieved 29 November 2014. ^ Bhise, Vivek D. (15 September 2011). Ergonomics in the Automotive Design Process. CRC Press. p. 68. ISBN 978-1-4398-4210-2. Retrieved 30 November 2014. ^ Millodot, Michel (30 July 2014). Dictionary of Optometry and Visual Science. Elsevier Health Sciences UK. p. 250. ISBN 978-0-7020-5188-3. Retrieved 30 November 2014. ^ Small, Robert G. (15 August 1994). The Clinical Handbook of Ophthalmology. CRC Press. p. 134. ISBN 978-1-85070-584-0. Retrieved 29 November 2014. ^ Peyman, Gholam A.; Meffert, Stephen A.; Chou, Famin; Mandi D. Conway (27 November 2000). Vitreoretinal Surgical Techniques. CRC Press. pp. 6–7. ISBN 978-1-85317-585-5. Retrieved 29 November 2014. ^ Alfaro, D. Virgil (2006). Age-related Macular Degeneration: A Comprehensive Textbook. Lippincott Williams & Wilkins. p. 3. ISBN 978-0-7817-3899-6. Retrieved 29 November 2014. ^ Colman, Andrew M. (2009). A Dictionary of Psychology. Oxford University Press. p. 546. ISBN 978-0-19-953406-7. Retrieved 30 November 2014. ^ Swanson, William H.; Fish, Gary E. (1995). "Color matches in diseased eyes with good acuity: detection of deficits in cone optical density and in chromatic discrimination". Journal of the Optical Society of America A. 12 (10): 2230. doi:10.1364/JOSAA.12.002230. ISSN 1084-7529. ^ a b Polyak, S. L. (1941). The Retina. Chicago: The University of Chicago Press. ^ Morris, Christopher G. (1992). Academic Press Dictionary of Science and Technology. Gulf Professional Publishing. p. 1610. ISBN 978-0-12-200400-1. Retrieved 29 November 2014. ^ Landolt, Edmund (1879). Swan M.Burnett (ed.). A Manual of Examination of the Eyes. p. 201. Retrieved 29 November 2014. ^ Johnston, J. Milton (1892). Eye Studies; a Series of Lessons on Vision and Visual Tests. Johnston. p. 56. Retrieved 29 November 2014. ^ Strasburger, Hans (2019). "seven myths on crowding". PeerJ Preprints. 6:e27353v2. ^ Gupta, AK. ; Mazumdar, Shahana; Choudhry, Saurabh (2010). Practical Approach to Ophthalmoscopic Retinal Diagnosis. Jaypee Brothers Publishers. p. 4. ISBN 978-81-8448-877-7. Retrieved 30 November 2014. ^ Alfaro, D. Virgil; Kerrison, John B. (4 September 2014). Age-Related Macular Degeneration. Wolters Kluwer Health. pp. 36–7. ISBN 978-1-4698-8964-1. Retrieved 30 November 2014. ^ Besharse, Joseph C.; Bok, Dean (2011). The Retina and Its Disorders. Academic Press. p. 4. ISBN 978-0-12-382198-0. Retrieved 30 November 2014. ^ Abramov, Israel; Gordon, James; Chan, Hoover (1991). "Color appearance in the peripheral retina: effects of stimulus size". Journal of the Optical Society of America A. 8 (2): 404. doi:10.1364/JOSAA.8.000404. ISSN 1084-7529. ^ Sebag, J. Vitreous. Springer. p. 484. ISBN 978-1-4939-1086-1. Retrieved 2 December 2014. ^ Li Zhaoping (8 May 2014). Understanding Vision: Theory, Models, and Data. OUP Oxford. p. 37. ISBN 978-0-19-100830-6. Retrieved 2 December 2014. ^ McIlwain, James T. (28 November 1996). An Introduction to the Biology of Vision. Cambridge University Press. p. 92. ISBN 978-0-521-49890-6. Retrieved 2 December 2014. ^ a b c Traquair, Harry Moss (1938). An Introduction to Clinical Perimetry, Chpt. 1. London: Henry Kimpton. pp. 4–5. ^ Savino, Peter J.; Danesh-Meyer, Helen V. (1 May 2012). Color Atlas and Synopsis of Clinical Ophthalmology -- Wills Eye Institute -- Neuro-Ophthalmology. Lippincott Williams & Wilkins. p. 12. ISBN 978-1-60913-266-8. Retrieved 9 November 2014. ^ Ryan, Stephen J.; Schachat, Andrew P.; Wilkinson, Charles P.; David R. Hinton; SriniVas R. Sadda; Peter Wiedemann (1 November 2012). Retina. Elsevier Health Sciences. p. 342. ISBN 978-1-4557-3780-2. Retrieved 9 November 2014. ^ Trattler, William B.; Kaiser, Peter K.; Friedman, Neil J. (5 January 2012). Review of Ophthalmology: Expert Consult - Online and Print. Elsevier Health Sciences. p. 255. ISBN 978-1-4557-3773-4. Retrieved 9 November 2014. ^ Dagnelie, Gislin (21 February 2011). Visual Prosthetics: Physiology, Bioengineering, Rehabilitation. Springer Science & Business Media. p. 398. ISBN 978-1-4419-0754-7. Retrieved 9 November 2014. ^ Dohse, K.C. (2007). Effects of Field of View and Stereo Graphics on Memory in Immersive Command and Control. ProQuest. p. 6. ISBN 978-0-549-33503-0. Retrieved 9 November 2014. ^ Szinte, Martin; Cavanagh, Patrick (15 October 2012), "Apparent Motion from Outside the Visual Field, Retinotopic Cortices May Register Extra-Retinal Positions", PLOS ONE, 7 (10): e47386, doi:10.1371/journal.pone.0047386, PMC 3471811, PMID 23077606, With our head and eyes steady, our normal binocular vision covers a visual field of about 200 to 220 degrees of visual angle. ^ Palmer SM, Rosa MG (2006). "A distinct anatomical network of cortical areas for analysis of motion in far peripheral vision". Eur J Neurosci. 24 (8): 2389–405. doi:10.1111/j.1460-9568.2006.05113.x. PMID 17042793. ^ Spring, K. H.; Stiles, W. S. (1948). "APPARENT SHAPE AND SIZE OF THE PUPIL VIEWED OBLIQUELY". British Journal of Ophthalmology. 32 (6): 347–354. doi:10.1136/bjo.32.6.347. ISSN 0007-1161. PMC 510837. PMID 18170457. ^ Fedtke, Cathleen; Manns, Fabrice; Ho, Arthur (2010). "The entrance pupil of the human eye: a three-dimensional model as a function of viewing angle". Optics Express. 18 (21): 22364–76. doi:10.1364/OE.18.022364. ISSN 1094-4087. PMC 3408927. PMID 20941137. ^ Mathur, A.; Gehrmann, J.; Atchison, D. A. (2013). "Pupil shape as viewed along the horizontal visual field". Journal of Vision. 13 (6): 3. doi:10.1167/13.6.3. ISSN 1534-7362. PMID 23648308. ^ Mollon, J D; Regan, B C; Bowmaker, J K (1998). "What is the function of the cone-rich rim of the retina?" (PDF). Eye. 12 (3b): 548–552. doi:10.1038/eye.1998.144. ISSN 0950-222X. PMID 9775216. ^ Williams, Robert W. (2009). "The human retina has a cone-enriched rim". Visual Neuroscience. 6 (4): 403–6. doi:10.1017/S0952523800006647. ISSN 0952-5238. PMID 1829378. ^ To, M.P.S. ; Regan, B.C. ; Wood, Dora; Mollon, J.D. (2011). "Vision out of the corner of the eye". Vision Research. 51 (1): 203–214. doi:10.1016/j.visres.2010.11.008. ISSN 0042-6989. PMID 21093472.